When I tell people I like Batman (the character), I pretty much always refer to the Christopher Nolan trilogy, and even then just to the first two movies, because whilst The Dark Knight Rises is still a great film, it’s far from being something I enjoy watching on a regular basis. The reason I don’t stretch my Bat-appreciation beyond this trilogy is because I’m not all that familiar with any movies outside of it. I’ve seen all the live actions ones before, including this movie, but I don’t think I paid nearly enough attention to any of them, and couldn’t reference a great deal other than maybe Batman Returns, which I think was more memorable, especially Danny Devito as the Penguin. 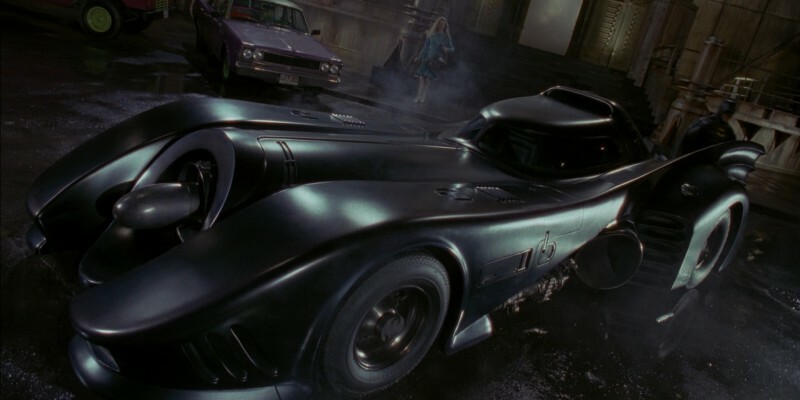 And the one I somehow quote most is the 1966 Batman: The Movie, despite only having seen it once 7 years ago. We deal a lot with Bills of Materials at work, so I often say “Some days you just can’t get rid of a bomb!” and the dialogue where Batman and co. are trying to work out who is behind a plot is some of the best I’ve ever heard: “It happened at sea…sea…C for Catwoman!” So any comparison I make to other Bat-films will be to the Christopher Nolan trilogy, which is in no way fair, but alas all I have to go on. This film was nominated for me to watch by DJ Valentine of Simplistic Reviews, and I know that he is a big fan of this film because he and I discussed it recently on an upcoming episode of the Lambcast. Therefore at least he is already aware that I didn’t like this movie a great deal. Had I seen it in 1989 I’m absolutely positive that my opinion would be different, but alas I did not, so I’m stuck thinking this is heavily dated, horrendously goofy and predominantly stupid. Let’s start with the basics. This is a film entitled Batman, but it’s definitely more about The Joker. As a character, Batman is already fully-formed at the start of the movie and doesn’t get much on an arc throughout, other than a few moments with his concerned butler Alfred (Michael Gough) and potential love interest/photojournalist Vicky Vale (Kim Basinger). As a character, he’s the same at the start as he is at the end. This is not the case with the real star of the film, Jack Nicholson’s Jack Napier. He begins as a mid-level right-hand man whose eye on his boss’ woman (Jerry Hall, what?) may cost him his life, but goes through a transition to a psychotic madman motivated by a desire for headlines and an affinity for chaos via puns and irony, namely killing people with laughter. Also – and this was probably a contractual obligation but still what the heck – Nicholson is billed above Michael Keaton. 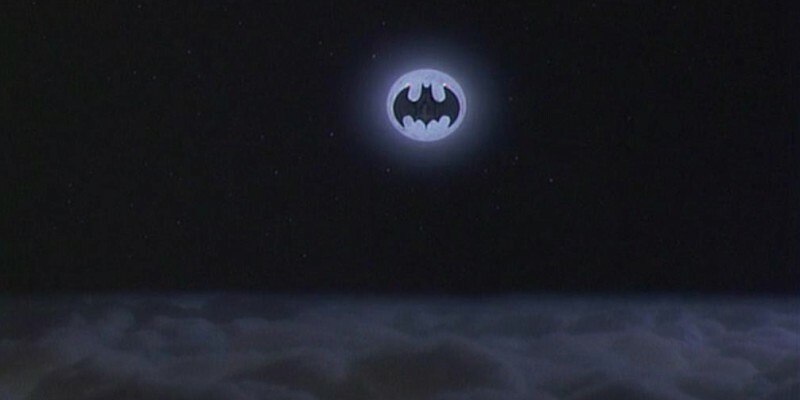 The opening credits go: Jack Nisholon, Michael Keaton, BATMAN. I’d heard the earlier films were slightly more based on the villains than the hero, but I didn’t realise it went quite this far. Secondly, Keaton. This is probably controversial (Especially with the aforementioned DJ), but I thought he was a terrible fit for the role. I never believed for one second that he was capable of doing anything the character on screen was doing. His Bruce Wayne, Batman’s real-life ridiculously wealthy alter ego, came off more like a bumbling professor than someone able to woo Basinger (unless she’s just an unrelenting gold-digger, in which case fine), and if you’re going to cast Keaton in the role, you need to let him be Keaton for more than just a couple of undeniably good moments (“You wanna get nuts? Lets get nuts!”). The design of everything Bat-related irked me too, and looked exceedingly cheap. His head mask, for example, was a hideous one-piece moulding that looked like an ugly early prototype sculpted from compact foam and covered in a thin rubber sheet. The Batmobile looked like it had been purposefully designed not to be able to turn a corner without the aid of a grappling hook (something that actually happens in a film when a relatively wide bend is encountered), and whilst the image of the Batwing or Batjet or whatever it is silhouetted against the moon is something even I can’t complain about, the actual ship itself wasn’t used nearly as much as it should have been given how much cooler it was than literally everything else in the film. Something else I found odd was how the Bruce Wayne = Batman plot device was handled, in that it seems to be played as though it both is and isn’t a secret. If I recall correctly, it isn’t confirmed that Wayne spends his downtime fighting crime dressed as a bat until very late in the film, with his identity being looked into by both Vale and her reporter colleague Alexander Knox (Robert Wuhl), but the notion of keeping his identity a secret to the audience is ludicrous for a character who was still very well known to audiences back in the 80s, due to the classic Adam West TV show and the hugely successful comics. Keaton-as-Bruce seemed to be in a different film to everyone else; a romcom in which his character has a secret his new prospective lover shouldn’t know, which felt more jarring than it should have. Nicholson is clearly having a lot of fun as the clear highlight of the film, and I suppose it’s worth seeing just for him, but barely. There’s a reason why the guy has won three Oscars and been nominated for nine others, and it’s because he’s got charisma and screen presence bursting from him like acid from his trick flower. He lights up the screen whenever he’s on it, so it’s no surprise that he’s top-billed really, considering without him there’s barely anything in the film worth talking about. He also gets most of the good, and oft-quoted, lines, like “Never rub another man’s rhubarb,” or the iconic “You ever dance with the devil in the pale moonlight?” Another thing I enjoyed, and it’s one of the very few elements that seeped into my memory, but it was one I’d somehow attributed to RoboCop and not this, was the third-act subplot involving the Joker putting some kind of deadly chemical into some unnamed cosmetics, so the city is unable to use any brands of make-up or toiletries of any kind. The effect of this is most keenly felt by the newsreaders, who are now seen as the same acne-ridden, frizzy-haired, yellow-toothed schmucks as everyone else, instead of the pristine visages of perfection they’d been in the past. Oh, one last thing, why are the score and soundtrack to this film so highly praised? I’d heard them described in the past as being amongst the best in history, and now I look back hoping that those statements were in jest. As Danny Elfman scores go it fits in amongst the rest, not being at all noteworthy from anything else, but the inclusion of Prince’s songs makes this a very odd combination. I recall two key scenes which played out essentially like music videos, with the Joker and his goons dancing along to the music in first a museum and later no a parade float, both of which made me wonder just what the hell I was watching, and who had thought including those scenes was a good idea? I’m sorry DJ, I just didn’t like this at all. 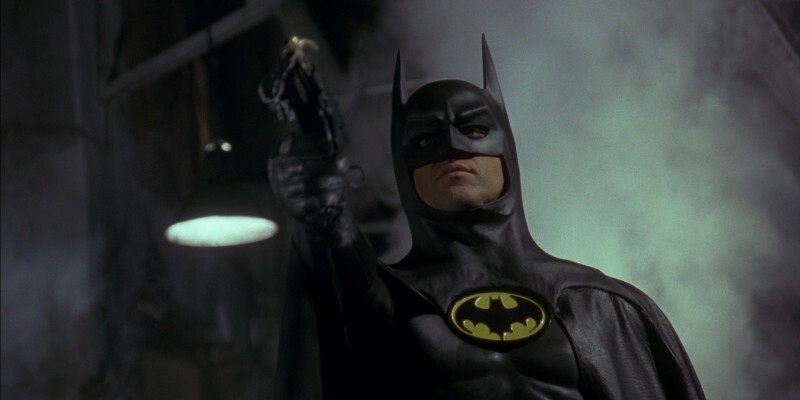 This entry was posted in 05/10, 1001, Choose Life, Empire Top 301, Empire Top 500, Nominated List, Review, The List and tagged Batman, Billy Dee Williams, Christopher Fairbank, Jack Nicholson, Jack Palance, Jerry Hall, Kim Basinger, Michael Gough, Michael Keaton, Pat Hingle, Robert Wuhl, Tim Burton by jaycluitt. Bookmark the permalink. Awww man, I love this movie. Part of the reason I do is because it is goofy, maintaining an element of fun while managing not to make Batman himself a humorous character as the Adam West TV show had done. I love the old show and the ’66 movie, but Batman needed to be a more serious person. I was one of those that walked into the theater in ’89 skeptical of Keaton, but I thought he pulled it off mostly because he WASN’T being Keaton. As you alluded to, time and place is important here, because at that time we were cringing at the thought of him going the Adam West route with the role. When he didn’t we all breathed a sigh of relief. I completely agree that Nicholson was the star of the show, though. This is true of a lot of comic book flicks. The villains are generally more interesting so they have the better roles with greater performances. 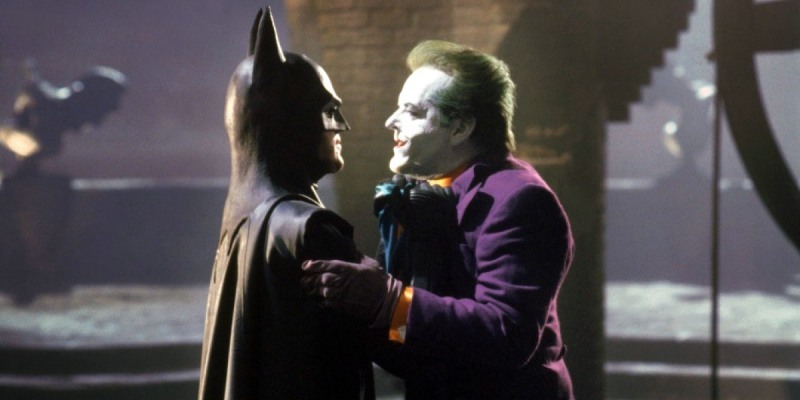 Besides, if we’re going to knock this movie for giving The Joker the most memorable parts of the movie and making him the star we have to knock The Dark Knight for doing exactly the same thing. I’m not willing to do that. As far as the involvement of Prince and his music goes, it seems we have Nicholson to blame for that. It came out before the movie that Jack was a big fan of Prince and pushed for him to do thw soundtrack. The two extended musical scenes may have been part of some appeasement of Nicholson. I can’t definitively say that, but I wouldn’t be surprised. For whatever it’s worth, I thought they were integrated well enough. Sorry Wendell, didn’t mean to diss on something you liked. I’d disagree with Heath Ledger’s Joker getting the most memorable parts in The Dark Knight though, as I can think of a lot of truly terrific scenes that he’s either not in or not at the centre of. 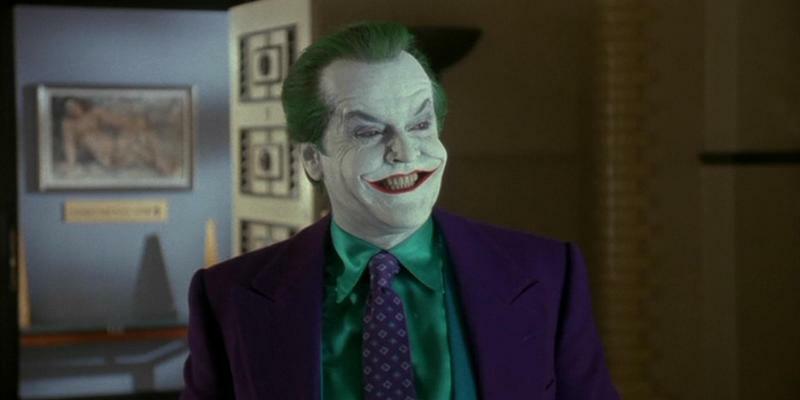 Ledger’s Joker isn’t actually in a great deal of TDK, whereas Nicholson’s Joker is all over Batman.